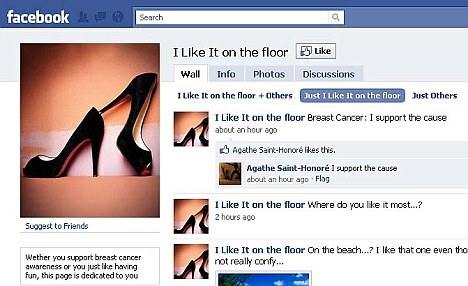 A new Facebook campaign in aid of breast cancer awareness is causing a stir around the Internet. The new suggestive status update “I like it on...” craze has swept the social networking scene as millions of women worldwide update their status. Thousands of Irish woman are partaking in the campaign by admitting where they “Like it”. Despite raising some eyebrows the ambiguous phrase has no sexual connotations but instead refers to the different locations where woman like to place their handbags or purses. October is breast cancer awareness month and this latest Facebook craze represents an unofficial campaign aimed at raising awareness. It was prompted by last year's Facebook campaign where woman updated their status detailing the colour of their bra.